YUMA, Ariz. – The last time Claudia Lugo slammed dope, she was dumped in a ditch and left for dead, like “trash,” she said. That night she was 38 years old, unsmiling and curly-haired, mascara smeared down to her cheeks, her face gaunt, her jaw hanging, her shirt red. But she didn’t die. Nine years later, she’s 47 and lives in a house on 14th Avenue – a fixer-upper with lace-white curtains, mismatched furniture and a bookcase stocked with self-help books. It’s where Lugo has lived her entire life. And if you drive her around the city, she’ll point at certain blocks and people walking on the street – all pieces of her former addiction. She’ll tell you about the trailer out of which she and her ex-boyfriend – now deceased after an overdose – sold drugs. Even now, just beyond her back porch, there are heroin dealers, she said. Sgt. Andres Angulo, of the Yuma County Narcotics Task Force, said Yuma’s heroin problem is consistent – the product of an active street dealing market in which the users are also the dealers. Though drug busts aren’t spiking alarmingly, Yuma’s heroin community peeks out of parks, rusted mobile homes, flophouse windows and through the slats of wood yard fences. Ricardo Gomez’s lean torso presses against a toolbox that he expertly balances on his bicycle, a colorful blanket covering the box and a machete strapped to his back. He pedals down Colorado Street near 18th Avenue in Yuma’s north end – one of Yuma’s heroin hotspots. Beads of sweat wet his brow in Yuma’s September sun. Gomez has been using heroin his entire life – whether he started at age 13, 14, 15, he doesn’t know. He’s been through rehab about three or four times. He didn’t think about the first time he did heroin – he just did it. He didn’t like it then, but just kept using for decades. Now 38 years old, he doesn’t think he’ll ever be able to stop. Just a few miles away away from Claudia Lugo’s home is what she calls “the dopehouse” – a common squatter spot for addicts. It’s a well-known heroin hub – unairconditioned, without electricity and running water, and with a large, untended front yard and a red blanket hanging over the porch. Inside, long-time addicts prepare spoons in the cramped, yellow-countered bathroom. Shelves holding various personal items and ashtrays are filthy with bits and pieces of heroin rigs and the saliva-yellowed butts of cigarettes. And even if users do recover, they stay in the heroin community as peer mentors or staff members at local methadone clinics and rehabilitation centers – the only places of employment where former addicts and drug felons are seen as qualified workers. Groups of people will line up earlier than 5 a.m. in the darkness to get their dose of methadone. Dozens from San Luis and Somerton – about a third of the clinic’s clientele – are bussed in early every morning before they head to the fields near the border to work. These exchanges are confidential, but the circled-up ex-users – some long sober, others perpetually relapsing – still talk about their addictions with clarity. Now, in her house, Lugo occasionally twists her lipsticked lips into a smile and cracks a joke. She passed another milestone for her sobriety – nine years – and she’s told this story countless times, it would seem. She wouldn’t get clean until, covered in mud, she stumbled into the Rural Metro station just down the street from the ditch to turn herself in on a drug sale warrant – the one she evaded after being arrested and bonded out in 2004. She had gotten caught crossing the border into the U.S. into the San Luis area, a packet of heroin tucked into her bra. She still remembers countless highs in her little bathroom, where she would religiously prep her needles. She recalls tucking her heroin rigs into her purse for work, and she hasn’t forgotten how her arms would bleed through her silk blouses – betraying her secret to her colleagues. Rubi grew up in Queens, New York, and was first acquainted with drug abuse as a child, when he saw his brother become a heroin addict. He promised himself that he would never use – until he did. In 2009, he was promoted to gunnery sergeant, and just a few months later, a random drug screen would unravel his untold world. He was less-than-honorably discharged after he “popped positive” for opiates, his binder full of certificates and photos only a painful reminder for what he had lost. His court martial would begin just one week after he would have received his gunnery sergeant pin – just another casualty of his undoing. He shot heroin for a couple years until May 23, 2012, when an officer would find the drug, a needle and a spoon in his rental car during a stop. By this time, he had lost his girlfriend and his job and had sold anything of value he owned to fund his addiction. He had blown through money left to him by his deceased father, only stopping short of selling his ex-girlfriend’s son’s video games – something he said he could never have done. He’s afraid of relapse, too – his dreams are regularly peppered with shooting dope, when he’s not having nightmares about his combat tour in Iraq. 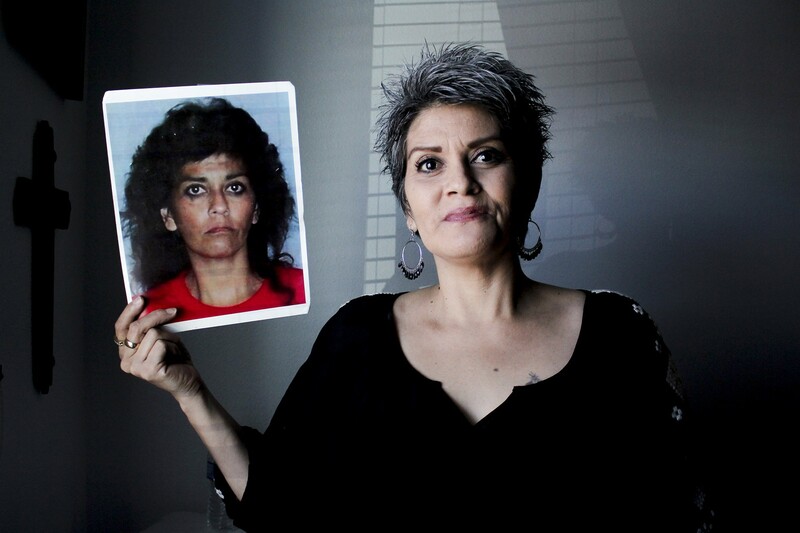 Claudia Lugo, 47, poses in her office at Crossroads Mission of Yuma with her mugshot. In 2005, Lugo turned herself in on drug sale warrants after she almost overdosed on heroin and was dumped in a ditch. 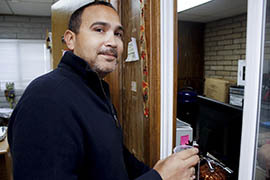 Richie Rubi, 38, prepares to take his daily dose of methadone at the Yuma Treatment Center on Nov. 21. A police officer found heroin, a needle and a spoon in Rubi's rental car during a stop on May 23, 2012.